Power handling: 300 W rms / 4 Ohms, 20 W min. 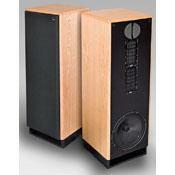 One of Brian Cheney's (may he rest in peace) better designs and a well made speaker for the money. Have owned about ten years, and the sound improves as better components and cables are introduced. Currently using Analysis Plus Black Oval Nine bi-wire speaker cables connected to Odyssey Audio Stratos Mono amps. Sources include a VPI Scout w/Origin Live arm, and most recently, a Aune S6 DAC/Headphone amp. Source cabling includes Black Cat Veloce digital from CD transport to Aune, Art Audio XLRs to PS Audio PCA-2 preamp, and Harmonic Technology PRO Silway II XLRs to the amps. The speakers have tremendous bass, and great vocals. Sound snapped into perfect focus when I positioned them per Brian's detailed instructions, including precise measurements from the speaker front to the single listening chair, and a laser to a simulated head---it does make a difference. Directional to the point that careful room placement brings them into focus. Had to add bass traps in listening room once all other tweeks were applied. Great for vintage rock.